Attracting dream clients and building great relationships with them has everything to do with how you communicate with them. If you're clear, authentic and relatable in your communication you connect with your audience on a deep level. They like you. They trust you. They choose you. We're here to help you create content that will help you build a strong, loyal and engaged community. Content which will make your dream clients happy and keep 'em coming back for more. Scroll down to see more details of who we work with, copywriting services we offer and our portfolio. Creative entrepreneurs who don't have time to produce original content (blog posts, newsletters, etc.) on a regular basis or who are looking for someone skilled to convey their brand message. Small businesses looking for clear and concise actionable copy for their online presence and interaction with clients. Online shops looking for an original and consistent voice for their marketing and sales materials, pitches or press releases. 1. Let's see if we're a good fit! Fill in a 5-part questionnaire and we'll get back to you in a jiff. 2. All being super, we'll send you a link to book our first call. We'll also send you a deep-dive questionnaire so that our first call is amazingly productive. 3. If you're happy with our first call and our approach to your copy needs, we'll send you a proposal and quote. 4. Once all of that's done, it's time to make magic. Captivating copy that makes your website pop and customers ready to buy from you. More pages can be included at an additional cost. 2. All being super, we'll send you a link to book our first call. We'll also send you a deep-dive questionnaire to complete so that our first call is amazingly productive. Blog posts that inform, inspire, entertain or persuade, written in your brand style and targeted to your ideal reader or customer. Does not include image-sourcing or graphic creation. ABOUT PAGE IN A BOX. 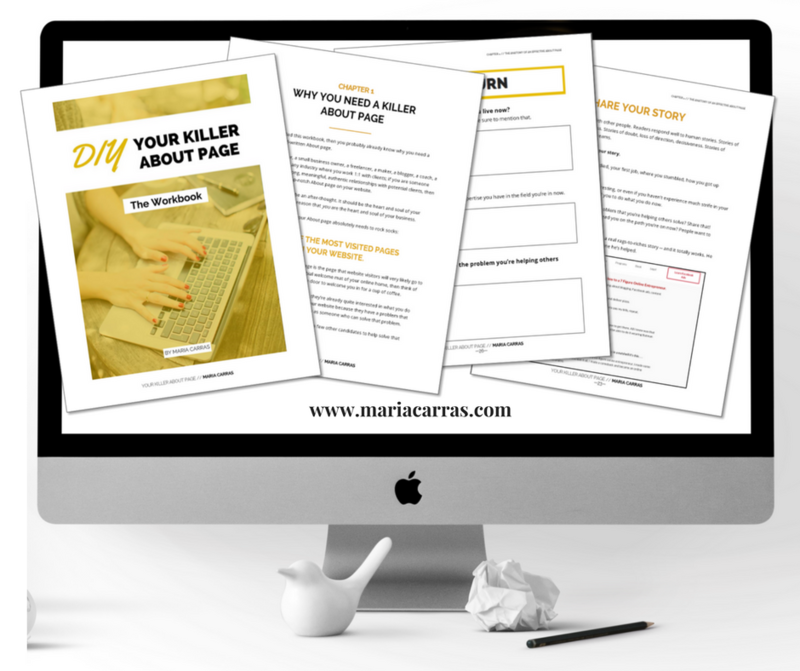 Get a brand-spanking new About Page written for you, showcasing you as an expert in your field and targeted to your ideal client in 1 week. DIY YOUR KILLER ABOUT PAGE. Purchase my interactive PDF that includes the complete framework, comprehensive guidelines and real world examples from successful entrepreneurs on how to create an awesome About page. Need something you don't see here? Let me know! Or, you can download our rate sheet for our additional services. Get it HERE. Luxury cruise liner travelling to Greece and Cuba. We wrote all of the web copy for the rebrand of this luxury cruise liner and continue to supply them with quality, on-brand blog posts. Leading provider of luxury villa rentals in Greece. We write blog posts that evoke the comfort, style and luxury of the White Key Villas experience. We wrote all of the web copy, product descriptions and the retailer pack. I also continue to create pitch emails, stockist lead emails, brand partner emails, press releases and other one-off projects. I continue to write three blog posts a month about travel, style, wellness and inspiring artists and adventurers. My posts are always whimsical and inspiring and in keeping with the wanderlusty feel of the brand. We completed five pages of detailed B2B web copy about the software, its features and the benefits to potential clients. The aim of the copy is to inform potential business clients about the software and invite them to trial the service using effective calls to action. I wrote daily copy about unique restaurants, shops, cafes, hidden spots and attractions in Athens, Istanbul, Mumbai and Tel Aviv, always maintaining a tone of mystery and adventure. Our newsletters reached 100,000+ subscribers every day.